Consistency Test of Cement is carried out inorder to find the determine the percentage of water required for preparing cement pastes for other tests. 1. Take an empty enameled pan free from dirt and other foreign particles. 2. Now take 300 gm of cement, and put that in the pan. 3. Add water, the quantity of water should be 30 per cent by weight of cement or 90 gm of water to it. 4. Mix the cement and water thoroughly. 5. Now, fill the cement paste in the mould of vicat apparatus, the interval between the addition of water to the commencement of filling the mould is known as the time of gauging and it should be between 3 to 4 minutes. 6. The Vicat apparatus is shown in the below figure. It consists of a frame to which is attached a movable rod weighing 300 gm and having diameter and length as 10 mm and 50 mm respectively. An indicator is attached to the movable rod. This indicator moves on a vertical scale and it gives the penetration. The Vicat mould is in the form of a cylinder and it can be split into two halves. The Vicat mould is placed on a non-porous plate. There are three attachments — square needle, plunger and needle with annular collar. The square needle is used for initial setting time test, the plunger is used for consistency test and the needle with annular collar is used for final setting time test. 7. 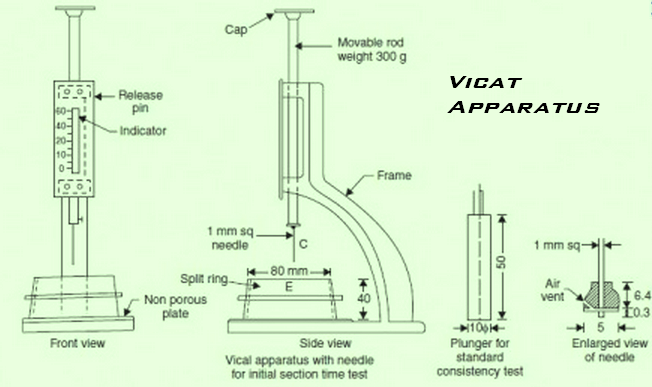 The plunger is attached to the movable rod of Vicat apparatus. The plunger is gently lowered on the paste in the mould. 8. The settlement of plunger is noted. If the penetration is between 5 mm to 7 mm from the bottom of mould, the water added is correct. If penetration is not proper, the process is repeated with different percentages of water till the desired penetration is obtained. This is the test procedure for Consistency Test of Cement.